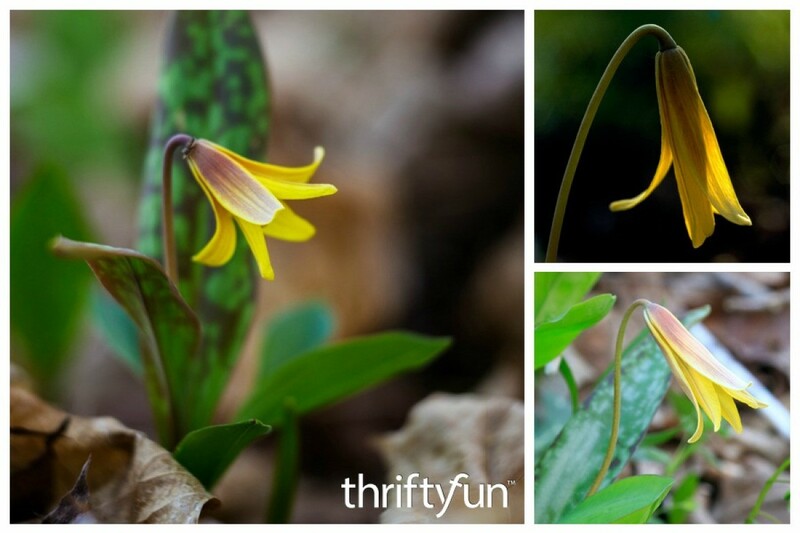 The trout lily, a perennial native of the eastern North American woodlands, is known for its pretty yellow flower, colony growth habit, and gray-green mottled leaves. This is a guide about, "What is this plant?" Trout lily (Erythronium americium). I've been trying to identify this plant for over a year and I still haven't found it. It looks like a miniature tiger lily with green leaves mottled with purple-brown. It grows wild here in the Sault, but I'm not sure if it's a wildflower or some kind of hybrid that escaped captivity. Any ideas? 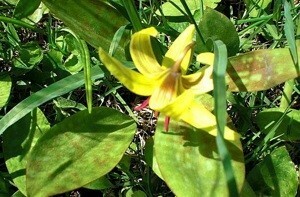 Looks like a trout lily. We have them all through our woods. I think you guessed it right,you can see a picture of the miniature tiger lily by searching for it, good luck. The common name is snake flower. I don't know the Latin name.